This is my adaptation of my friend Kirsten’s recipe for German cheesecake – with widely available Greek yogurt instead of Quark. Her recipe is called Quarktorte Tina. I have no idea who Tina is, and I don’t think Kirsten knows but the recipe is great. 1. Preheat the oven to 400 degrees F (200 degrees Celsius). 2. For the crust, mix all ingredients with well with an electric mixer to a crumbly consistency. Grease a 10-inch (25 cm) springform pan and distribute the dough evenly in the pan. Press it down with your fingertips and form an even 2-inch (5 cm) edge all around. Place in the refrigerator while you prepare the filling. 3. Mix the sugar, vanilla pudding mix (only the powder), vanilla sugar, oil, Greek yogurt and eggs with an electric mixer until smooth. Add the milk and mix well. 4. Remove the pan from the refrigerator and prick it several times with a fork. Pour the filling into the pan (it will be very liquid). Bake in the preheated oven at on the medium rack for 60 minutes. If the top browns before the time is up, place a large sheet of greased aluminum foil on top. 5. Turn off the oven and leave the oven door half open. Let the cake sit there until the oven is completely cooled down. Remove the sides of the pan and let the cake cool completely to room temperature, then refrigerate. That looks fabulous! 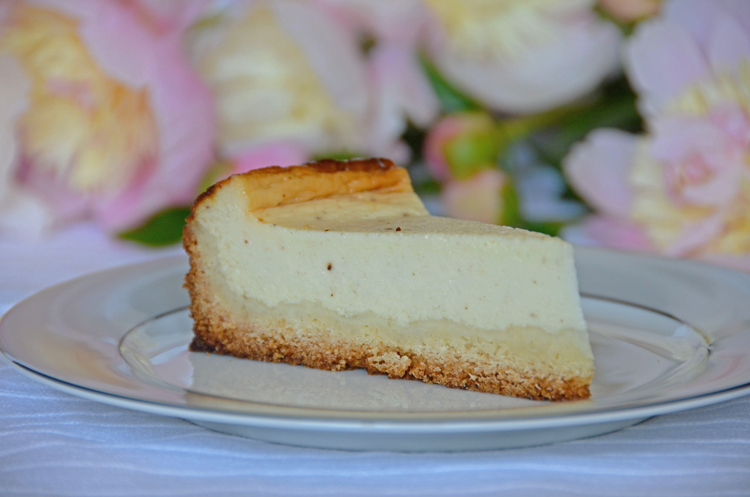 I’ve only made Käsekuchen once – it’s my husband’s favourite – but although it tasted delicious (I made it with a gluten-free crust so I could have it too! ), I did have a nightmare with the top repeatedly burning in the oven. Not quite sure how I managed that, but I’m looking forward to trying again. This recipe sounds great! Thanks. 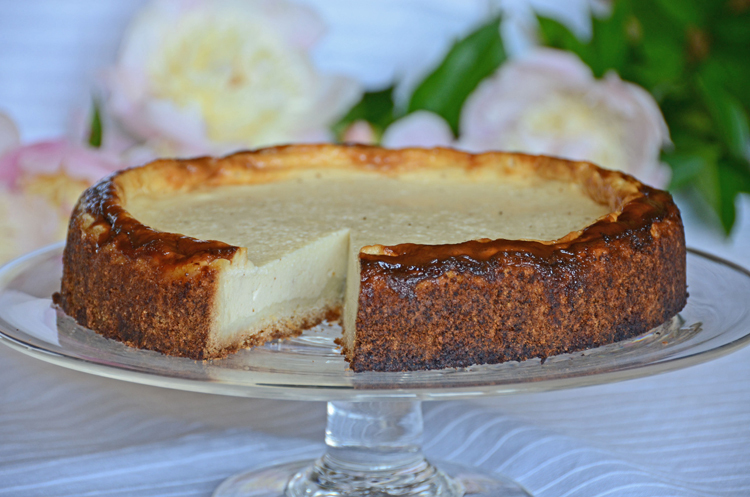 There are many good Käsekuchen recipes, this one just worked great for me with Greek yogurt as a substitute. I must say I envie you that you get just go next supermarket and buy all varieties of quark for a song. – As for the top burning I find that covering it with buttered aluminum foil helps, I hope it does the trick for you too. Oh that’s a good tip – thanks! Can you really not get quark over there? How frustrating – I was surprised to see it’s available in the UK now, though not very widely. Please . please put a print option with your recepis.. This oe took 4 pages. Thank you. Evi, Great suggestion, I added a printer-friendly button. But please note that in most of my blog posts, the recipes are preceded by a story so if you only want the recipe, you will need to remove the unwanted paragraphs individually. I can get good Quark here in the Cleveland area. Would the measurement be the same as the yogurt?? Just thought I’d double check before making it. Thanks…..love your blog. Lucky you! Yes it is the same amount of quark, as my recipe with Greek yogurt is simply an adaptation if you cannot find quark. If the quark is very moist, I would put it in a a colander lined with several layers of cheesecloth and leave to drain for 30 minutes, which will remove some of the whey. – Happy to hear you like my blog. Sammie, Did you follow my recipe, or are you referring to previous experiences with Greek yogurt in German cheesecake? The vanilla pudding mix for cooked pudding listed in my recipe in combination with the 2 eggs should set it, I have made the cake many times with Fage 0% and never had an issue. I cannot imagine the higher fat content in Fage 2% being the problem, as the manufacturer’s instructions for the pudding even call for whole milk. It might be that the filling is bit wobbly when still warm but nowhere near runny as you describe it, and it solidies as it cools, and even more when the cake is refrigerated. Hope that helps! how about if you use Farmers cheese , would that work too? Roswitha, that would definitely work too, but as farmers cheese can be rather dry and crumbly you want to make sure it is at room temperature, and creamy before mising in with the other ingredients. I would process the farmers cheese with a quarter or half of the milk that goes into the filling in a blender or food processor until smooth and then mix the filling as described. Does this recipe work in high altitude? Ilona, I have no experience with high-altitude baking so I can only assume that the recipe needs to be adapted, possibly less sugar, more liquid (milk), and baked at 425 F instead of 400 F. Depending on your altitude I might try following these guidelines: http://dish.allrecipes.com/high-altitude-cake-baking/ Hope that helps. I have tried kaesekuchen with small curd cottage cheese and buttermilk. The greek yogurt is by far the best choice….thanks for the idea!!! Where’s the recipe for the Vanille Zucker?